Planes, helicopters and even ballistic missiles - name a flying target, and the S-400 Triumph missile system can probably locate it and hunt it down. The system recently demonstrated all its glory during a tactical exercise at Russia's Alushuk base. 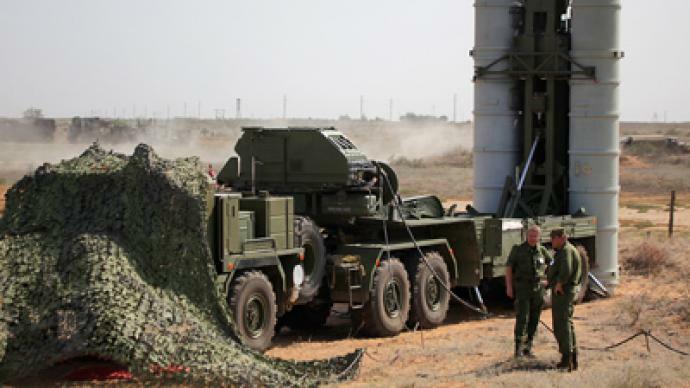 ­One of the strongest features of S-400 air defense system is its mobility. A full-scale air defense system can literally be created on the ground, anywhere, within minutes. Each S-400 system consists of several crucial elements. In addition to the launcher, there is a command post and two radars. One of the radars monitors the skies, searching for targets. After a target is identified, the second radar starts monitoring it, following its course. In the meantime the command makes the call on whether to eliminate the target. The timespan between the detection of a target and receiving a green light, after which the system opens fire, varies from several seconds to a couple of minutes, depending on the situation and the initial orders, lieutenant colonel Dmitry Belyatsky, a missile regime commander at the Ashuluk firing range, told RT. There are plans for S-400 to completely replace the S-300, the production of which has already been ended. The recent conflicts in Libya and other parts of the world have shown how vital it is to have reliable defense, not only from threats from the skies, but from space as well, Evseev says. And this is what the S-400 is designed to do. "The S-400 would allow us to defend both individual objects and large territories around them from ballistic missiles, and also increase the height of the interception," said Evseev. The S-400 Triumph is the latest generation of the long-range Russian air defense system developed by NPO Almaz-Antey. It is meant to defend crucial military and civilian areas from aircraft, cruise and ballistic missiles. It is capable of shooting down targets at a range of up to 400 kilometers, and altitudes of up to 60 kilometers, depending on the type of interceptor missile fired. A full division of S-400s can simultaneously track 36 targets and guide 72 missiles. The Russian Defense Ministry cleared the S-400 for service in 2007. There are currently seven S-400 divisions in operation in Russia, with a total of 56 missile launchers deployed. Although a version of the system for export purposes is currently in the works, there are no plans of selling it just yet, giving Russia an unprecedented advantage against any threat from the skies for at least the next 20 years. The system will not hit the international market before Russia's own demand for the regular version is met, commander of the Russian Air Forces Lt-Gen Viktor Bondarev reiterated last week.